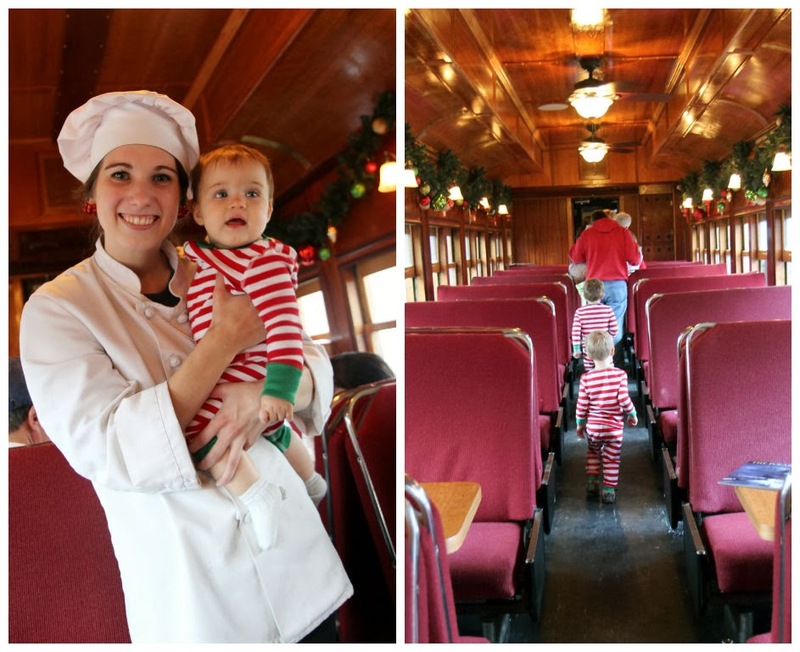 This post is about our experience on the Polar Express train ride at the Great Smoky Mountain Railroad in Bryson City, NC. You probably gathered as much from the title. An alternate title I considered for this post was: That Time Our Children Got So Delirious Off Sugar and Holiday Excitement That One Nearly Fell Out the Window of a Moving Train. But that seemed a little long. This Christmas we traveled to my parents' house in Tennessee and decided to make a whole vacation of it by scheduling stops along the way. After two nights in Asheville, we headed to Bryson City for the day. Many friends have asked my opinion of the Polar Express ride wondering if it would be a fun excursion to attempt with their kids next year. Rather than offering a flat Yes or No, I will paint a picture of our experience - complete with pros and cons - and let you be the judge on whether or not you'd like to venture to the "North Pole" as well. 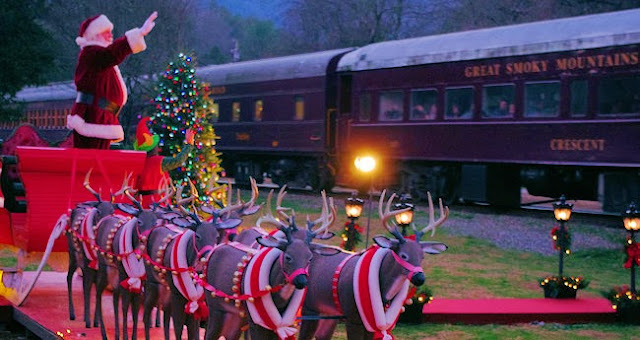 The Polar Express train ride is inspired by a children's book (and subsequent movie) of the same name. 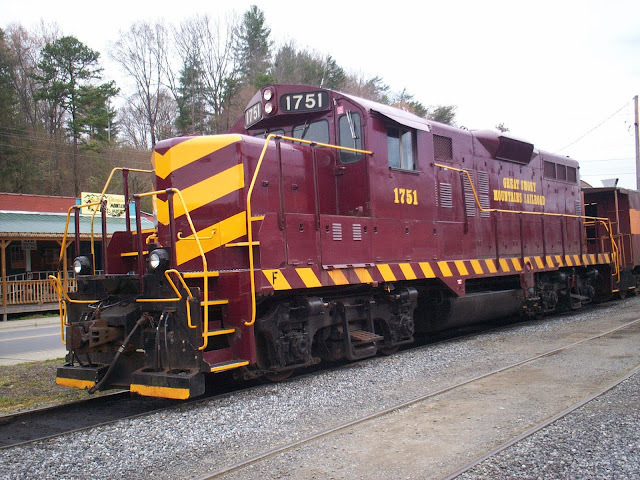 In the book, a young boy is awoken by a train whistle on Christmas Eve. Still in his pajamas, he goes to investigate and ends up taking a trip on the Polar Express all the way to the North Pole where he meets Santa and receives a gift of a silver bell from Santa's sleigh. 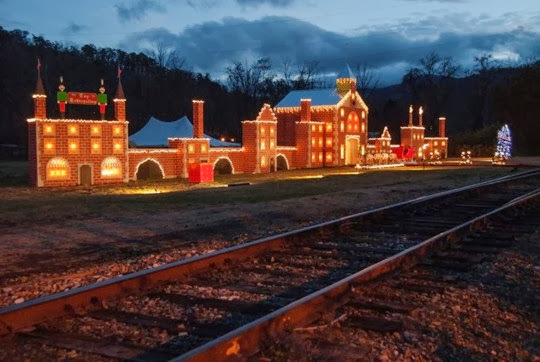 The Great Smoky Mountain Railroad has done a fantastic job of recreating this magical journey, including costumed characters from the book, treats on the way and a visit from Santa. They even encourage kids to wear their jammies on the trip! The GSMR website instructs arriving at the station one hour before departure. This is not a suggestion to trap you in the gift shop for an hour before your train leaves. They are serious. In true Hargett fashion we pulled in 30 minutes after the recommended arrival time. In my head I was thinking that we would just pull up to a quaint little train station, hop on board and be on our way. I was wrong. There is nothing little about this operation. 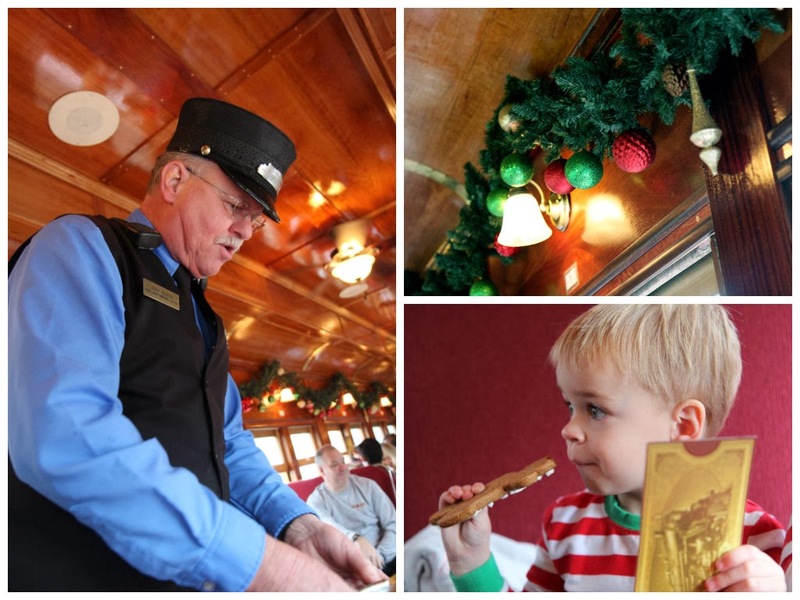 There were 35 different train cars on our Polar Express expedition holding nearly 2,000 passengers in total. In comparison, the population of tiny Bryson City totals about 1400. Bryson City is the train station along with several charming shops and restaurants nearby. The reason you do not see thousands of passengers milling about in these photos is because by the time we found parking, hauled our 3 kids and an extra-large diaper bag to the depot, picked up our tickets and located our train, everyone else was already on board. PRO: When you arrive late you avoid long lines. CON: When you arrive late you must bypass all the adorable photo ops around the station. Although John would probably consider that a pro as well. The last ones to board. We finally made it! The kids are getting EXCITED!! Mommy & Daddy are getting TIRED! The train is composed of beautifully restored vintage coaches dating from the 1920s to the 1940s. Upon booking your ticket, you will have the option of selecting a seat in coach, crown class or first class. We decided on first class for one reason and one reason only: TABLES. First class is the only option that provides large dining tables between the seats. You see, just as in the literary inspiration, this Polar Express also serves hot chocolate to its passengers. And the hot chocolate does not come in sippy cups. Therefore, we figured that if there were a table on which to rest our drinks, we could all possibly avoid wearing our hot chocolate all the way to Tennessee. You know what else is included in the first class experience? Bags of treats. LARGE bags of cookies and chocolates and peppermints and marshmallow Santas and other things comprised purely of sugar. The children immediately spotted them and began to hyperventilate with anticipation. They did not care that we were on a train dating back to 1949 that was once a lounge car on the historic Pennsylvania Railroad. Their sole ambition was to stuff as many sweets into their tiny mouths as humanly possible. "This bag is as big as my head!" shouted one. "CANDY! CHOC-WIT! SANTA! CANDY!" screamed the other. Well, we couldn't leave her out. And then, after the conductor came by to punch the golden tickets, the hot chocolate arrived. which is great because nobody ever has enough mugs at home. "Mommy! This is as big as my head, too!" PRO: The table makes a nice barrier between you and your children when they start convulsing all over the seat from the sugar overdose. CON: No one tells you to bring an additional bag to cart off all the stuff they give you in first class. After ensuring the children had consumed enough sugar to keep a small bakery in business for a year, the story of the Polar Express was read over a loudspeaker. PRO: If you bring your own copy of the book, your children can read along. CON: When they start fighting over who gets to turn the page, you will be forced to take the book away and somehow stuff it back into the bulging diaper bag that is now crammed with 5 gargantuan mugs and some half-eaten gingerbread men. PRO: If it happens to get a little stuffy in your car, you can simply open a window for a nice breeze. CON: When your 2-year-old discovers the window is open, he will promptly throw out several pieces of candy, part of the Christmas centerpiece and nearly tumble out himself, forcing you to shut said window and just sweat it out the rest of the trip. Then, we arrived at Santa's Village at the North Pole. Confession: I stole this photo (and the one below) off the internet. You do not actually get off the train at the North Pole. Also, our ride was during the afternoon, so we missed all the pretty lights. PRO: An afternoon train ride is a nice option for little ones who tend to get fussy in the evenings. CON: The afternoon ride is missing some of the magic of seeing the North Pole by Christmas lights on a dark evening. Also, in the daylight your children see ALL the scenery of the western NC mountains and you're pressed to come up with a plausible reason as to why there are so many trailer homes at the North Pole. Even with the sweets and the excitement of nearly falling out the window, the boys' favorite part of our journey was when Santa himself hopped on our car. Santa and the rest of the GSMR staff were incredibly friendly and enthusiastic. Even though it was probably something like their 800th trip to the North Pole, they were all upbeat, enthusiastic and ensured that each passenger had an extra-special experience. "And I want nunchucks for Christmas and my brother just wants Play-Doh." to be signed with a special message from Santa. PRO: Just like the boy in the book, each passenger receives a silver sleigh bell. The bells are engraved with "The Polar Express" and the date. The waiters lead the passengers in singing Christmas carols and the children shake their bells all the way back to the station. CON: The children shake their bells ALL THE WAY BACK TO THE STATION. Mommy & the kids as we pulled into the station. Daddy and the diaper bag as we pulled into the station. The one thing I've learned about traveling with little children is that you must throw all expectations out the window. In fact, if you anticipate the worst possible outcome, anything better ends up being a rather pleasant experience. We had no major injuries or meltdowns AND there was candy and Santa. All in all, I'd call that pleasant experience. It was a day filled with new experiences and family togetherness. And if you measure the success of an outing by the exhaustion level of all participants at the end, then the Polar Express takes the Christmas cake for sure. The Polar Express in Bryson City is best suited for children ages 3-8, particularly if they love the original story or have an affinity for trains. 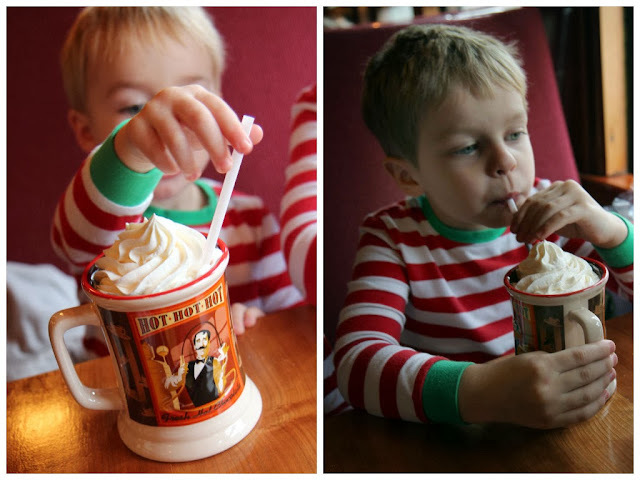 For us, we may brave the Polar Express again one day...but only when all of our children are able to hold their own mugs. That was absolutely wonderful to see you all experiencing The Polar Express. You can see The Kids (and Yourselves) had a Blast ! Thank You for Sharing it ! Love, Pop-Pop & Jo-Jo ! I love the honesty and humor in this post! Gorgeous family Anna. so thankful you did this post- we contemplated going this year, but are thinking it's a definite for next christmas. glad to hear 1st class is worth it ( minus the snacks that I will be "oh-so-sneakily" putting in my bag when we sit down. also glad to have the tip about taking the book with us. p.s. the last two pictures of john are EXCELLENT...he looks exhausted and like a good sport all at the same time! I am planning a trip on the Polar Express with my family this year and this post has some great tips! We will definitely bring the book with us! And maybe go at night... ;) Thanks!